The VTC-1.5 Facility is a small thermal vacuum facility equipped with a solar simulator dedicated to equipment testing. 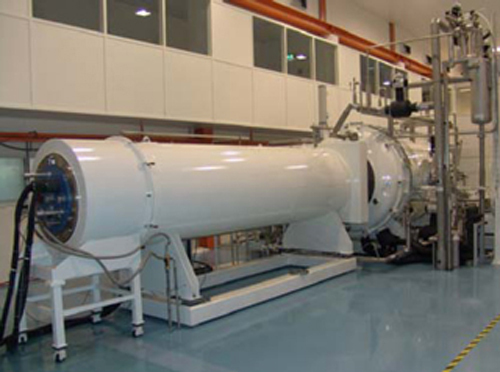 The facility consists of a 3.5m-long and 2m-diameter horizontal cylindrical vacuum chamber connected to a sun simulation source through a 900mm-diameter quartz window. The chamber is equipped with a 3-section thermal shroud system which can be operated either in gaseous or liquid nitrogen mode. In addition three independent liquid loop channels are capable of controlling the temperature of three conductive plates or customer specific MGSE. The high flux sun simulator is providing flux simulation up to 20 solar constants. Thanks to a fully automated thermal generator and specifically installed monitoring and control provisions the VTC 1.5 facility can be operated unattended in certain conditions e.g. during long duration tests.